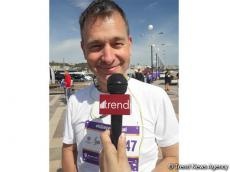 Organization of Baku Marathon 2018 is a great idea, Horst Kaufmann, a runner from Vienna, told Trend May 13. “I don’t live in Baku. I just came for the marathon. I participated in the marathon two years ago and now it is my second marathon here. I think it is a great idea to do this marathon. It is important for every city to organize such events so that everyone can participate in this kind of activity,” said the runner. Kaufmann expressed hope to come to Baku the next time to make a full marathon. “I don’t know whether this is going to be a full marathon in the future. I hope it to be 42 kilometers and then I will come and participate again,” he added. Baku Marathon 2018 kicked off May 13 under the auspices of the Heydar Aliyev Foundation. Held for the third time, this year’s Marathon retains its motto: Win the Wind. As many as 18,000 people have been registered to take part in this marathon. The Baku Marathon 2018 started at the National Flag Square and will run 21 kilometers all the way to the Baku Olympic Stadium. Residents of Azerbaijan’s Ganja, Sumgayit, Mingachevir, Guba, Gusar, Lankaran, Astara, Nakhchivan, Gabala, Shamakhi, Zagatala, Sheki, Oguz and other regions are taking part in the Baku marathon. Aside from Azerbaijani citizens, representatives of Italy, France, Russia, Turkey, Iran, Georgia, Ukraine, Belarus, Great Britain, United Arab Emirates, Iraq, US, China, Malaysia, India, Japan, Uzbekistan, Kazakhstan, Turkmenistan, Colombia, Lithuania, Latvia, Germany, Czech Republic and other countries are also participating in the competition.